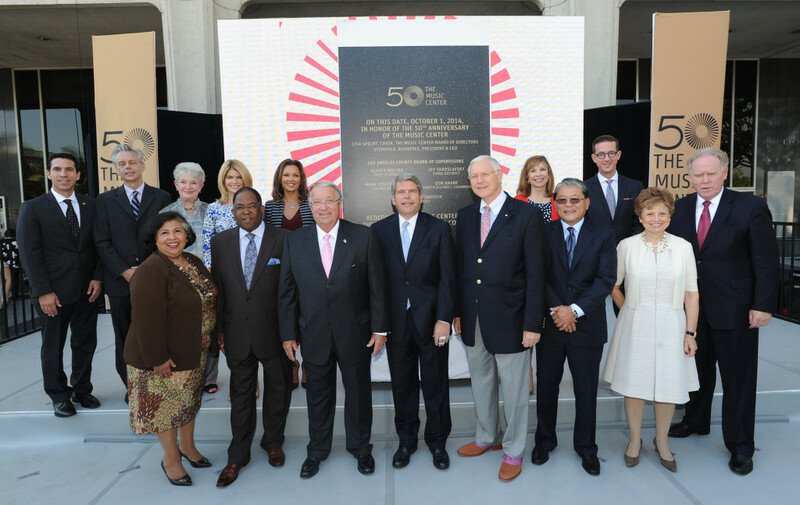 LOS ANGELES (October 1, 2014) – Los Angeles County Supervisors Don Knabe, Gloria Molina, Mark Ridley-Thomas, Zev Yaroslavsky and Michael D. Antonovich joined performing artists, artistic leaders and hundreds of Music Center volunteers for a special civic rededication as the performing arts center launches a number of 50th Anniversary public celebrations. Reminiscent of the original dedication of The Music Center to the community on September 27, 1964, this stunning tribute saluted The Music Center’s important, transformative role in Los Angeles over the past 50 years and recognized its many supporters. Held on the steps of the Dorothy Chandler Pavilion, the highly colorful ceremony honored the Los Angeles County Board of Supervisors, whose counterparts were credited with pioneering the public-private arrangement that provided the foundation for The Music Center, and who continue to play a vital role in its success. The event, sponsored by Wells Fargo and with support from Accenture, acknowledged The Music Center’s resident companies and the countless partners and volunteers who dedicate so much of their time, energy and resources to ensure The Music Center’s role as a premier arts destination. 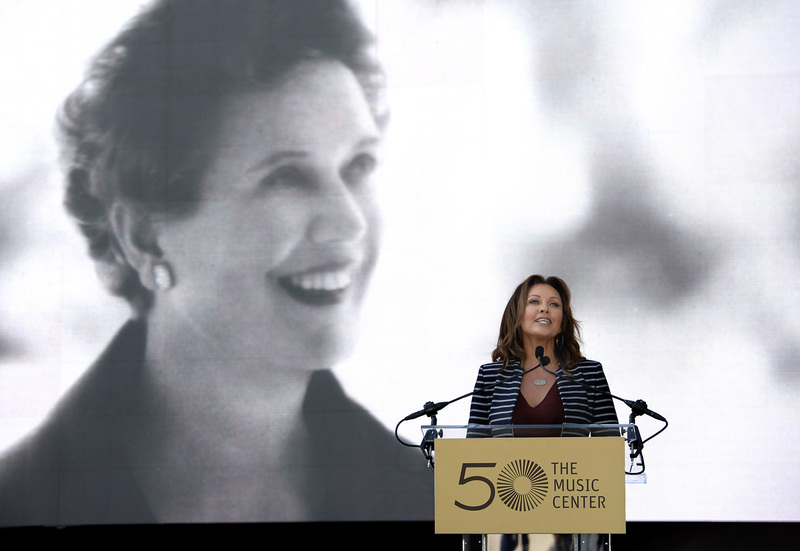 “This civic rededication for The Music Center marks an important moment in the history of both Los Angeles and the performing arts,” said Stephen D. Rountree, president & CEO, The Music Center. “As we recognize the achievements of Dorothy Buffum Chandler and The Music Center’s long-standing partner, the County of Los Angeles, for their continued support, we renew the commitment of The Music Center and our resident companies to presenting the best, most engaging and eye-opening performing arts experiences and inspiring the County’s diverse communities today and for future generations,” Rountree added. 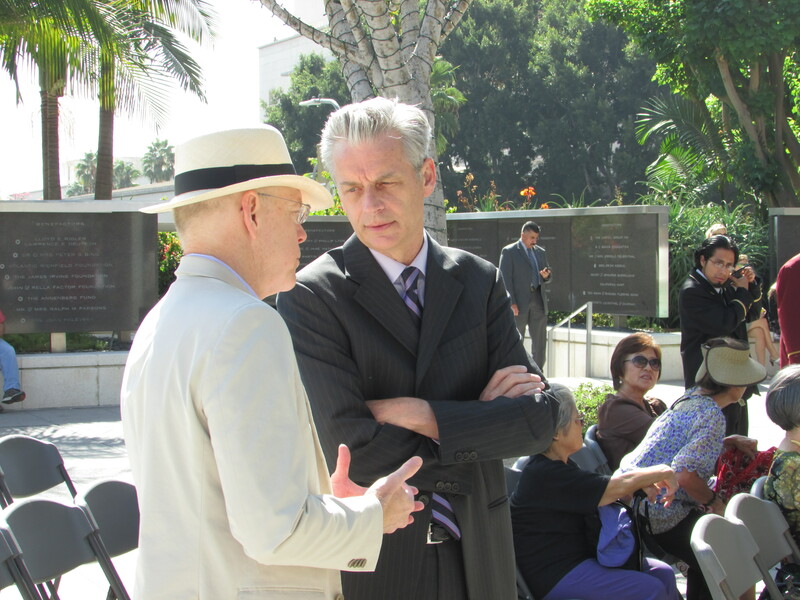 In addition to remarks by civic leaders and Music Center leadership, the rededication included a video tribute from Governor Edmund G. Brown Jr., whose father, Governor Edmund G. “Pat” Brown, helped make The Music Center a reality by signing the enabling legislation that allowed the County of Los Angeles to lease County land to a private non-profit organization, The Music Center Lease Company. That legislation provided the foundation for the public-private partnership that built and maintains The Music Center. “The dedication, the imagination, the courage, the generosity it took to launch The Music Center and keep it going these 50 years, that’s the spirit that built Los Angeles, that built California and really is exactly what we need in our history,” said Governor Jerry Brown. “So congratulations, those who made The Music Center happen, those who keep it going and the volunteers who work so hard to make this a reality for all the folks in the Southland,” he added. The event also included performances by Dale Kristien, who appeared for five years in The Phantom of the Opera at The Music Center’s Ahmanson Theatre; and Music Center Spotlight alum Jamael Dean, an award-winning jazz pianist. 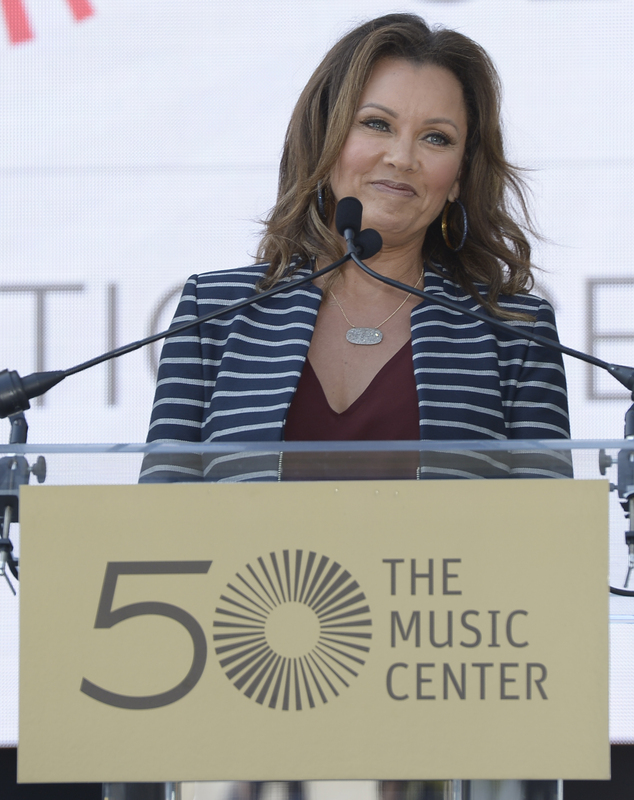 Actress and singer Vanessa Williams, who is currently starring in The Trip to Bountiful at the Ahmanson Theatre, relayed The Music Center’s history and shared her perspective on the importance of the arts in Los Angeles. 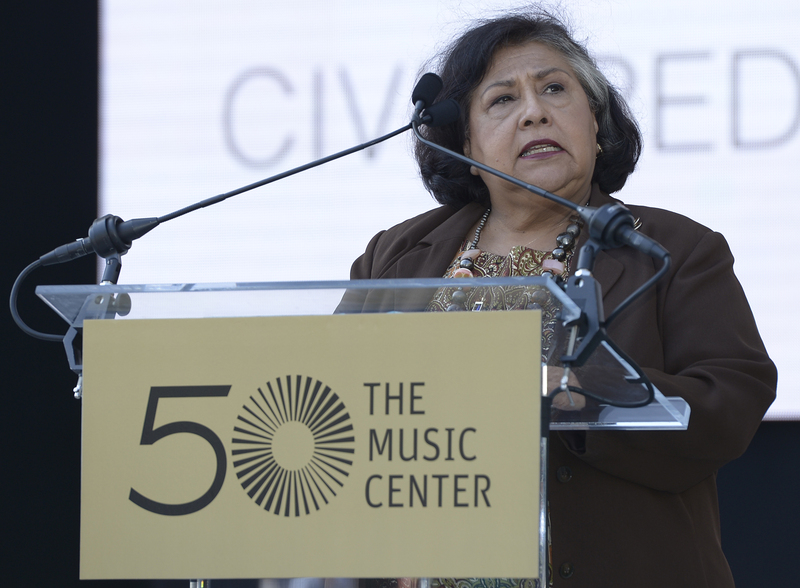 During the event, The Music Center also paid special tribute to three individuals—Los Angeles County Supervisors Gloria Molina and Zev Yaroslavsky, as well as Los Angeles County CEO William T Fujioka—who have been instrumental in supporting both The Music Center and the arts and who will be leaving their roles with the County later this year. 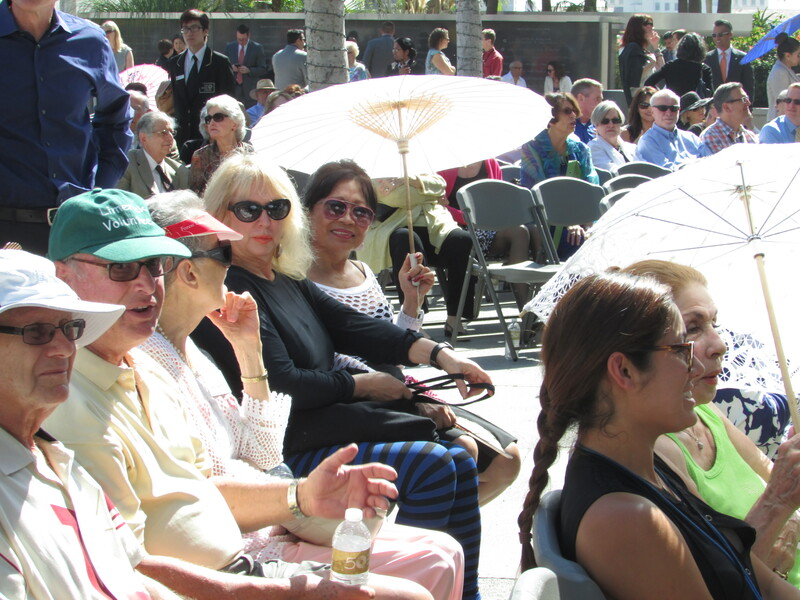 Attendees at the civic rededication ceremony learned about the vision Dorothy Buffum Chandler had for a permanent home for the performing arts in Los Angeles and her unfettered efforts to persuade political and business leaders that a lack of cultural facilities was holding Los Angeles back from recognition as a major world city. As history has shown, all sectors of the community rallied to support this effort, with the goal of providing access to world-class performing arts for all. 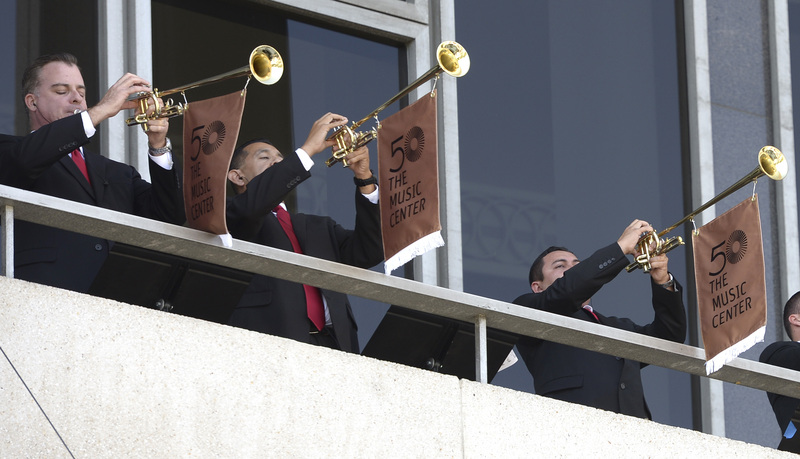 Today, The Music Center is one of the largest and most highly regarded performing arts centers in the country and has been hailed as an unparalleled example of cooperation between free enterprise and free government. With four of the nation’s leading resident companies and its renowned dance programming, The Music Center welcomes more than two million people each year to enjoy live performances as well as free arts events at its campus and at Grand Park in downtown Los Angeles. Gloria Molina was kind enough to share her thoughts with us about her contribution to the center, “I think this building is very important for our economy and society, we’ve funded several programs and provided kids with transportation”. 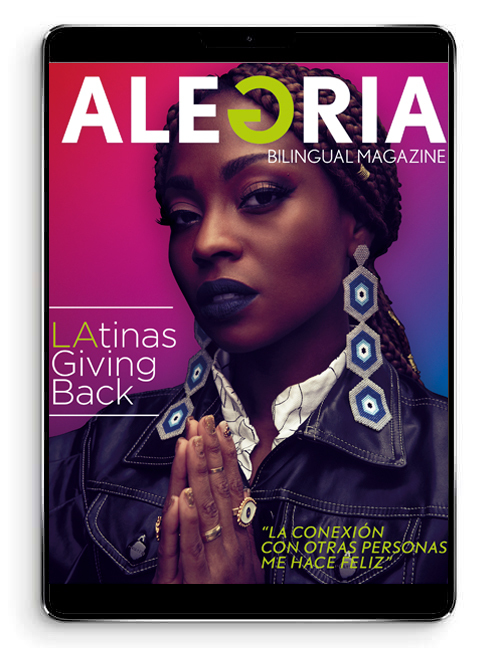 Till this day those programs exist as well as everyday transportation for students to their class and this superstar member of the board made clear that ALEGRIA is the people and helping in the society as a proud Angelino.